The following analysis of the First Angelical Calling (or Key) is excerpted from The Angelical Language: Vol I. I plan to release all 19 analyses over several weeks. Enjoy! The Angelical Calls are more than just keys to mystical gateways. In fact. they consist of a kind of biblical poetry – psalms, really- that appear to outline a connected message about the life of the Universe. However, exactly what that message says has been debated by Enochian scholars for decades (if not centuries). Like proper biblical literature, the wording is obscure enough that different readers see entirely different messages. Over the years, many have offered their own explanations of the “meaning” behind or within the forty-eight Calls. Here, I will present my own analysis of the poetry, and attempt to demystify the obscure language. The poetry of the Calls appears to draw from a range of biblical literature. The first. third, and final Calls each contain very Genesis-like aspects- describing the establishment of the physical world as we know it. Calls two, and twelve through eighteen, are reminiscent of psalms or verses from the Song of Solomon- being invocations of the Divine through praise. The Calls are generally classifiable as apocalyptic writings – which, like Loagaeth, commonly focus upon the cycle of time and the life and death of the Universe. Apocalyptic texts include such canonical books as Ezekiel. Isaiah, Daniel. and the Revelation of St. John. Calls four through fourteen, especially, remind me of verses from the Revelation, Isaiah, and so on. The word apocalypse is an archaic word for “revelation”- especially in the spiritual/mystical sense. It is through such an apocalypse that the prophets Ezekiel, St. John, and (of course) Enoch were able to glimpse the Divine Throne. It therefore makes sense that the Calls- and even Loagaeth itself- should be associated with apocalyptic literature. Not only were they received by Kelley and Dee via direct Angelic revelation (making them prophets in their own right), but the practice of the system (called Gebofal, see chapter 4) is intended to result in the revelation of mysteries. Not to mention the fact that the Angels associated the whole system with the Tribulation. There is also a Gnostic literary style to the poetry. For instance, the Calls written from ladbaltoh’s viewpoint bring to mind such ancient writings as The Thunder-Perfect Intellect– wherein the Gnostic goddess Sophia speaks to her followers. (Remember that Sophia- or Wisdom- appears in Dee’s journals as the Mother of Angels: Galvah.) The treatment of the Christos (“He That Liveth and Triumpheth”) in the poetry is also very Gnostic in its imagery. However, I must remind the reader that the classical Gnostic texts we know today were unknown to Dee and Kelley. During their lives, the classical (or Sethian) Gnostic sects had long since been exterminated, and the discovery of the Nag Hammadi texts in Egypt was hundreds of years away. In the meantime, Gnosticism had lived on in the very foundations of Western esotericism-at the hearts of such movements and philosophies as Hermeticism, Rosicrucianism, and alchemy. Its imagery survived in medieval and Renaissance engravings and the Tarot trumps. Its literature was a heavy influence upon canonical biblical texts (such as the Book of John and Revelation). Many of its mysteries were shared with and adopted by Jewish Merkavah mystics and Qabalists. And its Doctrines were preserved and taught by isolated mystics and secret societies. There had also been a Gnostic sect within the Catholic Church for a time-founded by a Christian teacher named Valentinus- until it was also exterminated. It would appear that Valentinian philosophy was the primary source of Gnosticism for much of the West, including for men such as Dee. With all of this taken into account, it is no surprise that the forty-eight Calls should bear the mark of Gnostic symbolism, without being technically classified as Gnostic literature themselves. For brevity’s sake, I will conclude this introduction and proceed to the analysis of the Calls. In what follows, I have provided the text of each Call. Then, each is broken into “sections” of related passages, and I have included my commentary with each section. The commentary will include further references to the influences upon the poetry we have already discussed. Most of Call One appears to be composed of the words of God Himself. As we see in the line above, the speaker of the Call establishes that he is not speaking his own words, but those of the God of Justice (lad Balt or Iadbaltoh). By quoting the very words of the Creator at the time of their creation, the speaker is reminding the Angels of the promises they have made, and the commands given to them by God. (We shall see this elsewhere in the Calls.) The speaker is also proving that he knows these secret words, and thus establishes his own authority. Remember that Call One is intended to move the “Kings and Ministers of Government” who are also the ‘First Seven”. 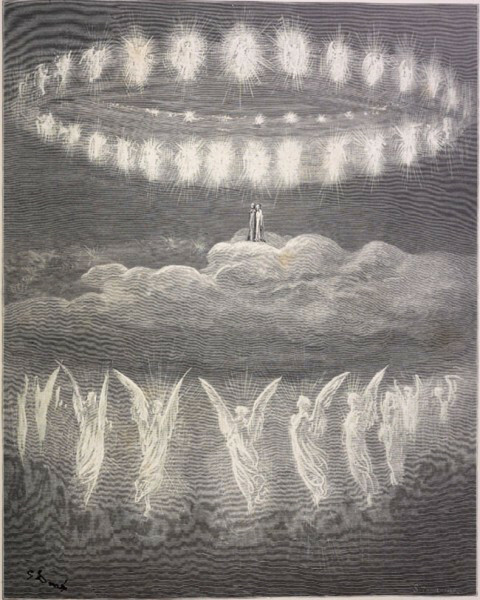 These are likely the seven Archangels who “stand before the Face of God” as depicte’d in the Revelation of St. John and elsewhere. Among these seven planetary Archangels, those of the Sun and Moon stand as chiefs. The first line of the Call reveals that the God of Justice is so exalted (likely super-celestial as in Gnosticism), even the mighty Sol and Luna arc but tools or weapons in His hands- a sword and a “through-thrusting fire” (fiery arrow). Which measureth your garments in the midst of my vestures and trussed you together, as the palms of my hands. Whose seats I garnished with the fire of gathering and beautified your garments with admiration. To whom I made a law to govern the Holy Ones, and delivered you a rod (with) the ark of knowledge. In the first line above, the initial word “which” most likely refers to the Sun and Moon described in the previous line of the Call. In the study of astrology, the path of the Sun and Moon across the sky is used to distinguish the twelve principal constellations from among the chaotic mass of stars. Because of this, the Sun and Moon are credited with bringing order to chaos, as well as the government of the planetary and zodiacal Angels. From the standpoint of astrology it is Sol and Luna who “truss together” the signs and planets (the kings and ministers of government). It is they who mark out (measure) the paths of the stars through the vault of the Heavens- the vestures (territories) of ladbaltoh. The next line suggcsts that God has garnished the seats of Sol and Luna with the “fire of gathering.” This makes sense when we consider that the Sun and Moon are said to burn with a mere reflection of the Fire from Heaven. The line then addresses the kings and ministers once again, and suggests that the Sun and Moon have “beautified your garments.” The planets in our solar system are beautified by glowing with the light reflected from the Sun. Moreover, you lifted up your voices and swore obedience and faith to Him that liveth and triumpheth; whose beginning is not, nor end cannot be; which shineth as a flame in the midst of your palace, and reigneth amongst you as the balance of righteousness and truth. With the word “moreover”, Iadbaltoh changes the subject of his speech. He is, of course, still addressing the kings and ministers, but He suddenly appears to refer to a Divinity distinct from Himself- “Him that Liveth and Triumpeth.” This would seem to be a direct reference to the Christos– the Anointed One who descends from Heaven to take on a body of flesh and triumph over evil (“liveth and triumpheth”). In the Book of Revelation, the Christos conquers the physical realm and is established as eternal King. We have already discussed the Gnostic Christos (also called the Logos, or Word). It is both self-created and eternal, both distinct from and part of the Highest God. The descriptive terms used in Call One to describe “Him that liveth … ” are typical of the Christos. He is described as eternal, and (in the same spirit of the Call thus far) is associated intimately with solar imagery. He “shineth as a flame” in the midst of the palace of the Holy Ones, as the Sun shines in the center of our solar system. Both the Christos in Heaven and the Sun in the celestial realm are the central pillar and balance. (Interestingly, Gnostic texts describe the Christos’ first act as that of bringing balance to the realm of the Aeons. It then descended to the physical realm, to do the same here.). Therefore, Call One serves to remind the Angelic rulers of the Universe that they have sworn themselves to both Iadbaltoh and the Christos. Move, therefore, and show yourselves. Open the mysteries of your creation. Be friendly unto me. For. I am a servant of the same your God; the true worshiper of the Highest. Finally, the Call ends with an evocational formula – or conjuration. As we shall see, all of the Calls end with similar conjurations. All of them are spoken by the speaker of the Call rather than by a figure- such as God- being quoted within the Call. However, there arc a couple of instances where Iadbaltoh is quoted within the formula. Herbal washes and waters are among the most popular tools used in traditional forms of shamanism and folk magick around the world. They have existed for as long as humans have known how to make herbal teas, but their uses go far beyond medicinal beverages. In fact, they are exceptionally powerful tools in any witch‘s arsenal—it might just be easier to list the ways in which herbal waters cannot be used than to list all of their diverse applications. Visit any botanica (shops that cater to African and Caribbean Traditions, such as Santeria, Voodoo, and Hoodoo) and you will typically find several shelves fully stocked with herbal washes for as many purposes as you can imagine. Yet, for some unfathomable reason, they have been slow to work their way into modern forms of witchcraft. Perhaps this is due to the less-than-amicable relationship between most indigenous folk traditions and modern Neopaganism. In past decades, some aspects of the older systems (such as their focus on the dead and underworld, and their use of animal sacrifice) made many Neopagans uncomfortable. As a result, many things—even very useful things—that originate in those traditions were overlooked by Western practitioners. Today’s witches and ritual magicians are much more open to magical items that might be found on shelves next to skulls and coffin nails. However, some of these, like herbal washes, are new and mysterious to modern students, who are often unsure exactly how they are intended to be used. Greetings Fellow Wielders of Magick! Regardless of whether or not an individual spell mentions the involvement of some entity, I would be hard-pressed to find a single operation that is not *greatly* enhanced by invoking the participation of my familiars, helpers, and patrons. Whether they are communicating with me (often telling me how to make the spell better), opening the Gates for me, arguing in my favor on the other side, carrying my spells to their targets, guiding me through some astral realm, or simply standing beside me in my Temple performing a ritual along with me—my spirits are involved in everything I do. It’s not simply the fact these types are jumping to a ridiculous conclusion that makes this funny to me. It also speaks to something I’ve noticed across the board with atheists and skeptics (especially the outspoken ones): they always adopt the most outlandish and fantastical views of anything spiritual or mystical—taken entirely from Hollywood and fantasy fiction—and apply those views to the real thing. Hence, if Mickey Mouse can use a grimoire to conjure hoards of animate brooms to clean his master’s lab, then why can’t you conjure gold bars when you need them? Wizards in the Harry Potter stories can conjure food, shelter, clothing, and other necessities at will, so why can’t you? Doctor Strange doesn’t call on help from an “occult community” when he is in need or in danger, so why are you setting up a crowd-funding campaign? Shouldn’t the Dark Forces be taking care of you? But, what if we remove dualism from the equation? Incense, Oil, Parchment, Holy Waters, Etc. 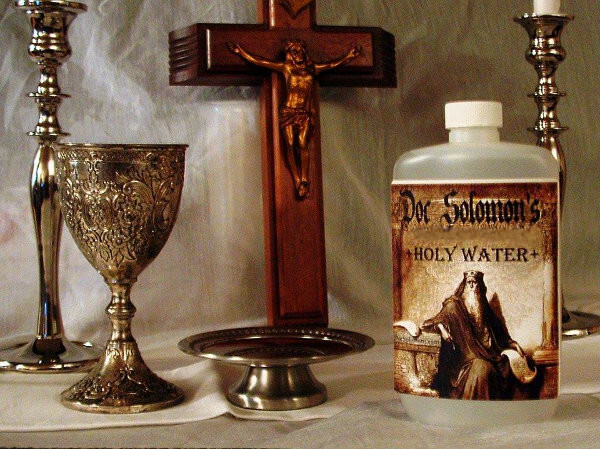 Holy water has many spiritual applications. It can be used for blessing, purification and consecration, added to baths for cleansing, sealing of the home, exorcism/driving away unwanted spirits and even offered as a libation to saints and angels. We use pure spring water and sea salt, mixed together with a stick of hazel less than a year old. The water is consecrated by an ordained Priest, on the day and hour of Mercury during the waxing Moon. We can only make one or two batches of this a month, so supplies will be limited by the magical timing. 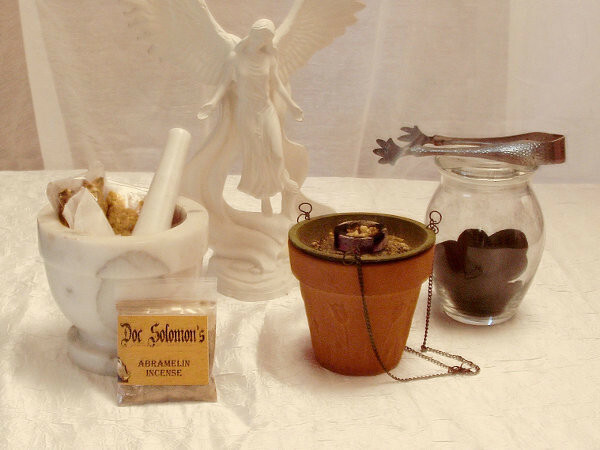 The formula for Abramelin Incense is based upon that given in Exodus 30:34-38 – where it was reserved only for use in the Tabernacle (and later the Temple of Solomon). Our Abramelin Incense is made with freshly powdered frankincense (“incense in tears”), benzoin (in the stacte, styrax or storax family), cedar and rose petals. It is then exorcised and consecrated by an ordained Priest. Abramelin Holy Oil is a very powerful anointing oil, used to consecrate tools, robes, furnishings, and (of course) oneself. It can also be used to seal the doorways and windows of your home for protection. The recipe for Abramelin Oil is based directly upon the Holy Anointing Oil described in the Biblical Book of Exodus, chapter 30:23-25 – by which all holy furnishings as well as Aaron and the Priesthood were consecrated. True Abramelin Oil is nearly impossible to purchase, because the correct recipe is rarely followed. 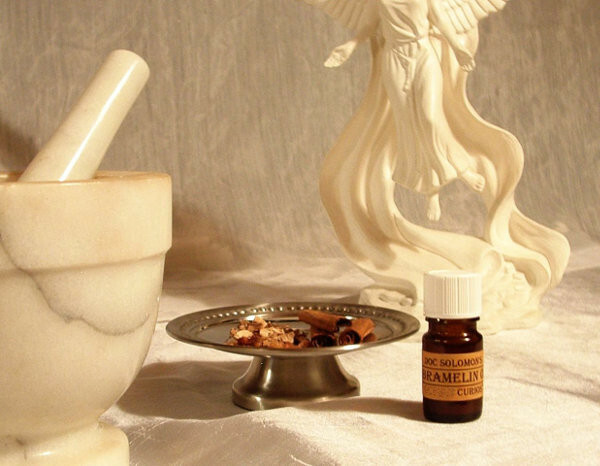 Commercial “Abramelin Oil” is usually compounded from essential oils, using the wrong weight measurements, and is therefore often dangerous to use (due to containing large amounts of pure cinnamon extract): it can burn the skin and eyes. Our Abramelin Holy Oil is made by hand, exactly as the Bible instructs – following all measurements and using “the art of the apothocary” (an extraction process lasting several weeks) to extract the oils from the plants. It contains pure olive oil, and extracted tincture of cinnamon, myrrh, and calamus. Our Oil will not burn your skin, barring any allergies to the ingredients. Please test any oil before use by placing a very small drop on your skin to make sure there are no negative reactions! Some projects require the use of consecrated virgin parchment for the inscription of spiritual texts. While there exist complex ritual instructions for making such parchment from scratch, we simply lack the facilities or skill to do it right. (Plus the cost would be prohibitive!) However the also exists a consecration for existing (yet still virginal) parchment. Fr. Aaron performs this consecration on the day and hour of Mercury during a waxing moon. 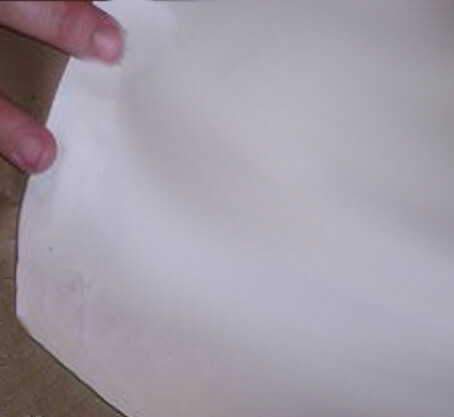 We currently offer white calligraphy-grade parchment (prepared on a single side). It is ritually consecrated, and wrapped in a blessed white linen cloth. Available in sheets of several sizes, depending on your needs. Contact us for pricing. Stay Tuned for more from Doc Solomon’s Biblical Supply! Not a popular thought indeed! It was hardly just Crowley behind the HGA push in the Western Mystery Tradition. Israel Regardie picked up that flag and flew it in his work, and from those guys it was picked up by—well pretty much everyone else. (Except the Neopagans—but we’ll get back to that in a bit.) Especially among the Golden Dawn and Thelema crowds, the concept of achieving “Knowledge and Conversation of the Holy Guardian Angel” became paramount. It was billed as the highest achievement of the adept, the “thing” toward which we should all be working. Without it can nothing else be accomplished! It is our Western version of Enlightenment. That’s a very lofty philosophy, and I can’t blame those early Golden Dawners (yes, including Crowley) for sensing something vastly important at the heart of the Abramelin Rite. I certainly did! But now we run into a snag. As wonderful and transcendent as the HGA may be, we don’t actually find him everywhere, do we? Open Source Order of the G.D.